The long hot days of summer yield many things: tall golden grasses sprawling across our hills, crowded beaches where locals flock to escape the inland heat, and in the garden, more tomatoes than you can shake a stick at. After waiting patiently for the past several weeks, the anticipated reward of this juicy, sun-ripened favorite is at hand–ready to be plucked from the vine in all its glory. I wait all year for these few precious weeks of tomato harvest, resolving to make the most of the season by cooking up enough fresh sauce to last me until next summer. Personally, I can’t buy supermarket tomatoes. Bred commercially to hold up over long distance shipping, these tasteless fruit are pure disappointment compared to summer’s fresh crop. One might as well throw money down the drain! Plus, there are so many varieties to choose from. 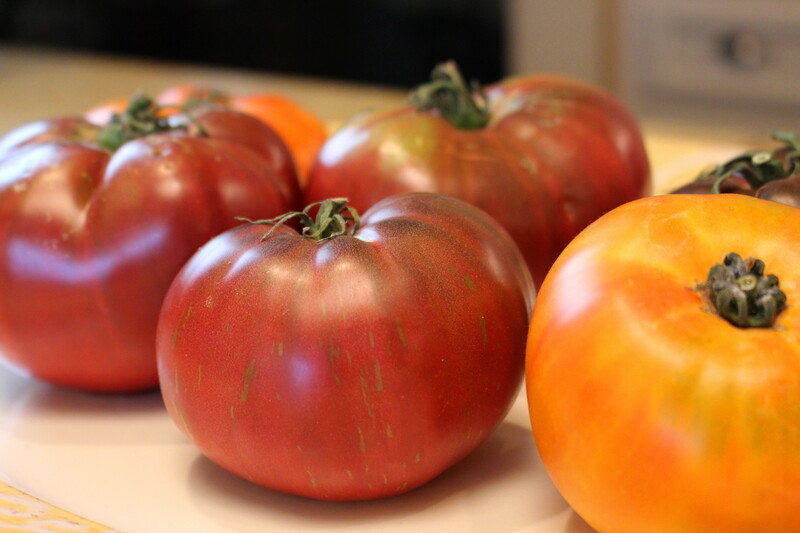 Along with mainstream favorites like Beefsteak, Early Girl, and Roma, growers have popularized lesser-known heritage varieties presenting consumers with an abundance of offerings. With an estimated 3,000+ heirloom tomatoes in cultivation, there is literally a tomato to suit every palate. If you’ve visited a local farmers’ market recently, you know what I’m talking about. You’re likely to find Brandywines, Japanese Black Trifele, Sun Gold, Sweet 100’s, Green Zebra, Black Krim, Cherokee Purple, Black Cherry, Pineapple, San Marzano, Early Girl, Yellow Pear. . .the list goes on, and on! The vendor booths are as much a feast for the eyes as they are the senses–bursting with specimens in a rainbow of colors: pink, gold, crimson, black, green, yellow, brown, variegated, and of course, red. This year my garden has Juliette, Early Girl, and Sweet 100 Cherry in the mix. Finding creative and tasty ways to use the abundant harvest is always a challenge so if your vines, like mine, are straining under the weight of ripened tomatoes, try these three tried and true recipes for making the most of the season’s bounty. *Who says tomatoes aren’t for breakfast! Heat oil in a medium frying pan over medium heat. Add onion and bacon (if using), and sauté until lightly brown. Drain off any excess fat. Add chopped tomatoes and simmer, stirring occasionally, until they have released their juices, about 4-5 minutes. 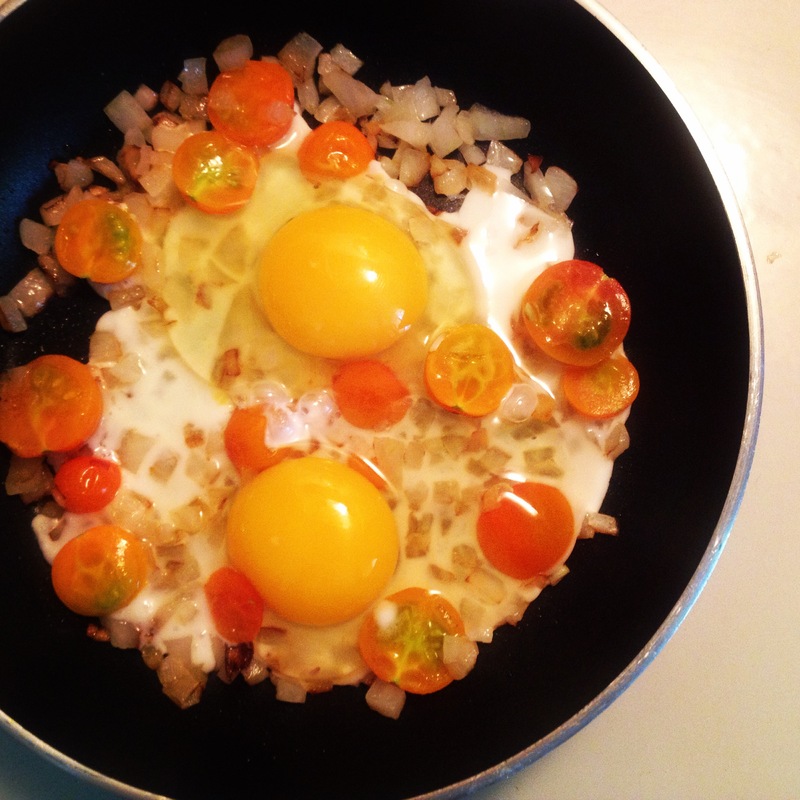 Make 4 wells in the tomato mixture with a spoon and crack an egg into each well. Cover the pan with a glass lid, and simmer until egg whites are firm and yolks are starting to set (about 2 minutes). Remove lid, sprinkle with cheese, and cover again to melt. Sprinkle with fresh basil and scoop onto individual plates. Serve with good quality sliced rustic toast. Delicious! 2. In a small juice glass, mix fresh pesto with extra virgin olive oil, stirring with a spoon. 3. Drizzle over tomato/cheese slices, followed by a drizzle of balsamic vinegar. 4. Garnish with fresh basil and serve. *My dear friend and local chef, Susan Lustenberger of White Rose Ranch, makes a killer version of this dish. She inspired me to experiment, and this recipe is the result. 1. Preheat oven to 350. Lay pie crust in a 9″ pie place, pricking the bottom and sides with a fork to prevent bubbles. Pre-bake crust for 10 minutes. Remove from oven and set aside to cool. 2. Lightly salt sliced tomatoes and allow to drain in a colander for 20 minutes. Rinse and pat dry to remove excess moisture. 3. While tomatoes are draining, sauté sliced onion in 2 tablespoons olive oil over low heat until caramelized, about 15 minutes. Set aside. 4. Mix 2 cups grated cheeses, mayonnaise, garlic, and a couple grinds of black pepper. 8. Remove, cool before slicing, and enjoy! Love Tomato’s and this was very fun to read. Thanks! When we have too many homegrown tomatoes to eat, we puree them (no need to cook them), put them in mason jars (3/4 full) and stick them in the freezer. 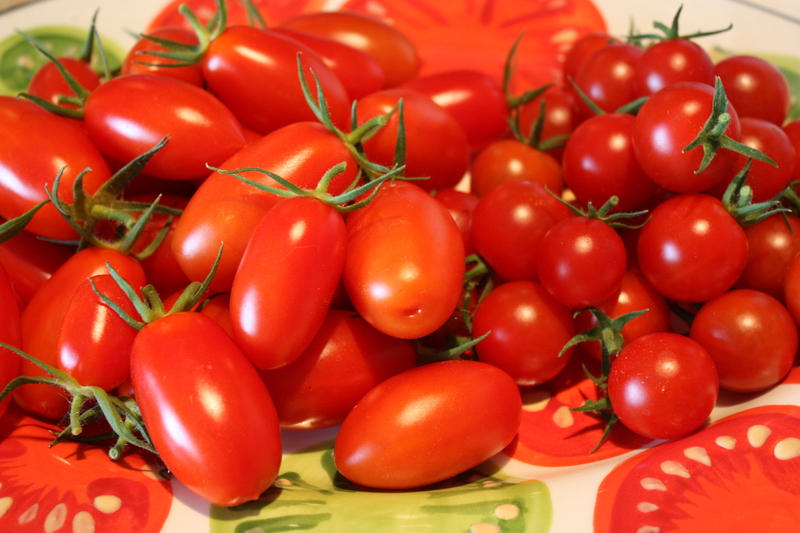 It’s wonderful to make tomato soup in the middle of January with our sweet homegrown tomatoes! Love that idea Nancy! Thanks for sharing. It’s a winner Janet. Thanks so much for reading and hope to see your smiling face one day soon! 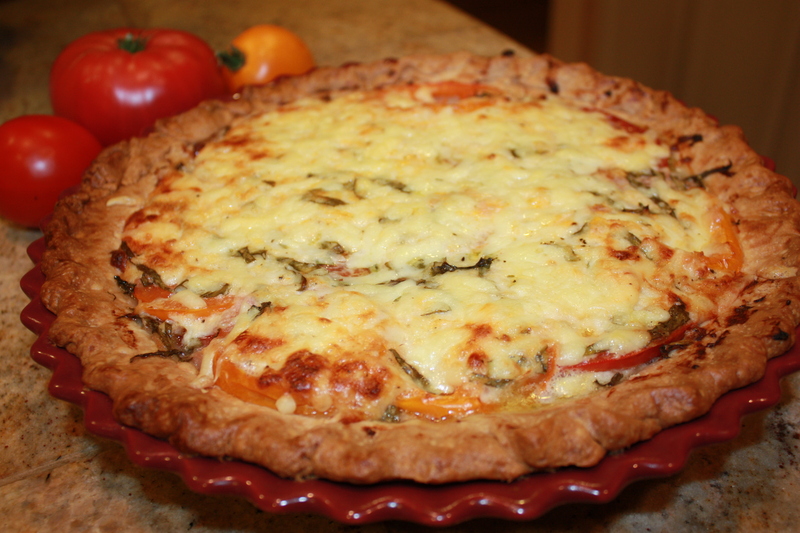 I can’t wait to try that tomato pie – that sounds amazing! And having just purchased some “on the vine” supermarket tomatoes that were truly tasteless and mealy, I know the difference of which you speak. 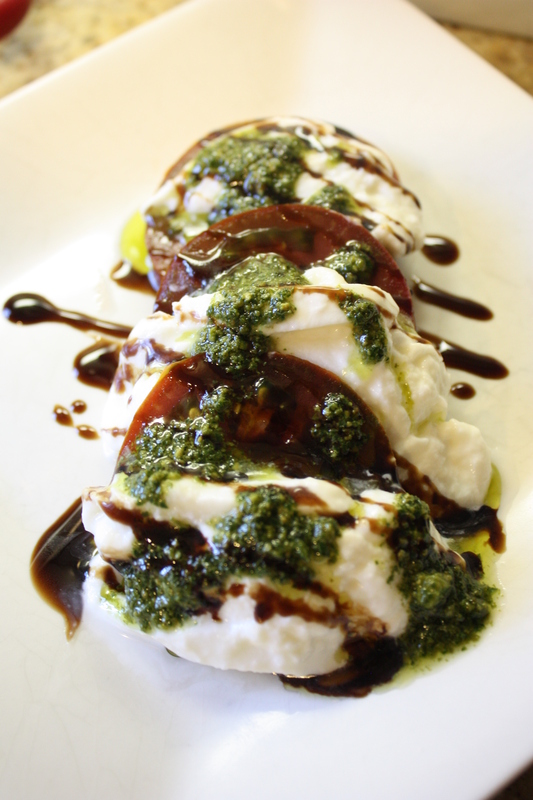 Your article made my mouth water – and I have to wait till Sunday for our farmers market!!! Thank you for the sumptuous recipes and reminder that the farmers market is WORTH the wait! You will LOVE that savory Tomato Pie, Kathy. Even finicky kids eat it up like there’s no tomorrow. 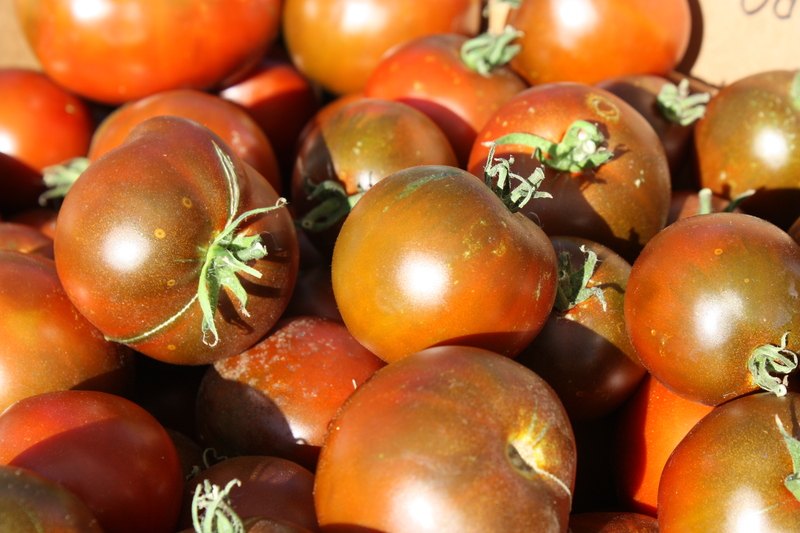 Definitely grab some of those lovely heirlooms at your farmers’ market and give it a try!